That being said, it does not bring us any closer to understanding how a novel can help us better understand issues relating to architecture and urbanism. While some may will still invoke the works of J.G. Ballard or Samuel R. Delany as examples of writers who tackle buildings and cities as the object of their narrative, we still are at the initial conundrum that informs this post: these, and other works are primarily representational in nature. The authors of the Concrete Islands, Dhalgrens, and Make Room, Make Room's of the world provide very little guidance as to how to operationalize their critique. One way to approach this problem is via the architectural metaphor. Thus, some critics will deploy the language of architecture critique to analyze a narrative. The word "architectonic" is often use to understand a novel's expansive length, or perhaps even its materiality. On the other hand, an author's biographical facts are brought to bear: an early interest in architecture or urban planning is thus made an important critical fulcrum on which arguments are carefully balanced. The works of the famously misanthropic fantasy novelist H.P. Lovecraft provide an interesting and plausible take on this situation. And this is the case not only because Lovecraft is one of those writers who successfully deploys architectonics and materiality in service of profoundly architectural observations. This is so because Lovecraft lived a manic intellectual existence where an unabashed love for historic preservation was counterbalanced by a deep hatred for modern architecture. Others have detected similar strains in Lovecraft's work. The novelist John Banville, writing in a 2005 issue of Artforum, even notes when Lovecraft moved to New York in 1924 with his wife, he "found the city a great and, despite an initial period of uncharacteristic uncheeriness, terrible shock; the baroque metropolises of his fiction, infested with monstrous beings, are his response to the spectacle of New York in the early years of the Roaring Twenties." Banville then quotes a particularly gruesome bit from Lovecraft's "He" (1939): "Garish daylight shewed only squalor and alienage and the noxious elephantasis of climbing, spreading stone ... the throngs of people that seethed through the flumelike streets were squat, swarthy strangers with hardened faces and narrow eyes" . The surface of the earth today is overlaid with a irregular, dense web of fibres, entirely fabricated by humans. In this web circulates the life-blood of the social. The transport of people, of commodities, of provisions; multiple transactions, orders to buy, orders to sell, facts to be believed, other, more intellectual or affective, exchanges ... This incessant flux continues regardless of humanity, absorbed in the lifeless convulsions of its own activity. of the earth. Many recount the grandeur and the decadence of a race; others, more simple and geometric, seem to evoke disquieting mystical suggestions . Here is an architecture of urgency. An architecture realized by Houellebecq's and Lovecraft's oscillations between the monolithic and microsopic, the decaying and the verdant, the dead and the living. This interplay of extremes is "An effect of scale, effect of vertigo. A procedure borrowed, once again, from architecture" . The words "once again" betray Houllebecq's belief in the essential architecture that is Lovecraft's fiction. It is as if, in reading this most cryptic of authors through the critical lens of an unabashedly unpleasant French anti-liberal, one must admit that the darkest literary impulses carry forth an architectural imprimatur. Lovecraft's literary predilections certainly echo the works of earlier avatars of the Gothic. In fact, his musings on style would no doubt remind a student of architecture of the strange, proto-modernist musings of Eugene Emmanuel Viollet-Le-Duc (who, in a particularly Lovecraftian take, signed all his documents with an ink rendering of a bat's wing). What is fascinating, if not totally convincing, is that architecture springs forth from a most unlikely of sources: the work of H.P. Lovecraft. 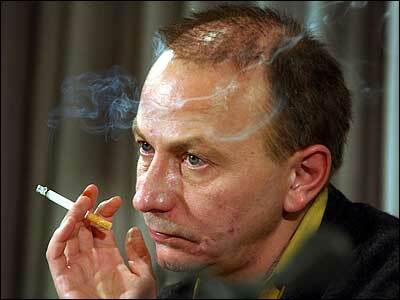 Michel Houellebecq, H.P. Lovecraft: Against the World, Against Life, Robin Mackay, trans (2004), p.10 (accessed at http://blog.urbanomic.com/dread). Enrique, I'm amazed you made it through an entire breakdown of Lovecraft and architecture without using the word 'cyclopean'. Well done. You've seen Aranda/Lasch's 'Rules of Six' at Design and the Elastic Mind? The non-euclidean _wrongness_ of it (in the best way) made me think of Lovecraft. Inhuman geometries, 'vast, cool and indifferent'. Hey Fred ... I did see Aranda/Lasch's work at MoMA. I can't say that they were as weirdly offsetting as Lovecraft's prose. And thanks for the note ... I've been wanting to write about Lovecraft for a long time. His work is *SO* obsessed with architecture and landscape. For this post, however, I wanted to let others "speak", which why I found both Banville's and Houellebecq's words captivating. I still think there is room for using literature in the service of architecture criticism, but much needs to be said on how to do this. I found Adam's post on the topic (hyperlinked in the text) really compelling and useful. Still, the trick is, how do we "instrumentalize" literature for the services of studying architecture and urbanism. Methinks it is perhaps a futile question, and yet I found Houellebecq's approach really, really interesting and (strangely) useful).